The event was held in a 30ft x 90ft Marquee which was connected to the club house via a 10ft x 20ft walkway. The decor of the Marquee consisted of Ivory pleated linings with a Gold swag. The Marquee was carpeted with charcoal marquee carpet on an interlocking Boarded Floor. Guests were seated at 5ft Round tables with white banquet chairs with gold pads. 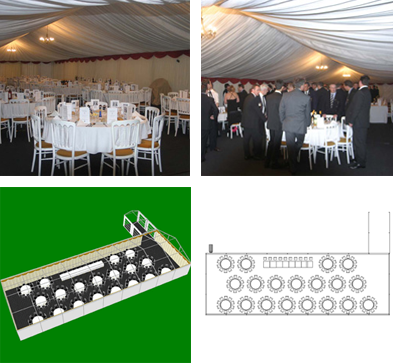 As the event was held in March the marquee was heated with a 70KW indirect heater. As with many club events the marquee was used for three events making use of our discount scheme.